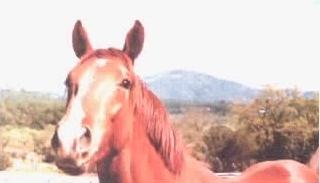 GEVA was founded to provide homes for injured, retired, and abused horses, or horses just in need of a home. We are dedicated to preventing the inhumane and needless slaughter and abuse of horses. GEVA was also founded for the equally important mission of providing training in the skills necessary to humanely and safely work with horses. Our goal is to be able to accept all horses in need, and through our “adoption program” place them well in loving homes. Some may not recover sufficiently from their injuries to return to riding soundness and may remain as pensioners with GEVA, or possibly become a companion for another horse. Others will go on to be pleasure horses, show horses, or just pets. All of these options are certainly preferable to the inhumane conditions of slaughter or needless euthanasia. Even “unsound” horses can enjoy life and companionship, as do “unsound” people. People are not euthanized or slaughtered because of an infirmity. So, why are horses subjected to such a fate? GEVA is supported primarily by tax deductible donations and fund-raising events. We actively seek funds from grants, and also provide some facilities for lay-ups and conditioning, which generate additional income. Last year GEVA received another much appreciated grant from ASPCA…We hope to again be included in their distribution of grant funds this year. GEVA recently received a much appreciated grant from Thoroughbred Charities of America (TCA), which is the charitable arm of the Thoroughbred Owners and Breeders Association based in Lexington, KY.
We have horses for “adoption” as well as for “sponsorship”. Sponsors receive photos and regular communication on the activities and condition of their horses. All donations from sponsors are tax deductible. For those who have committed to and fulfilled the obligation to a “full sponsorship” for one year, GEVA also offers three (2) nights of free lodging at Glen Ellen Farms in the wine country of the Sonoma Valley in Glen Ellen, CA, where GEVA is located. Although our expenses may be more, the cost of full sponsorship for one of our horses is one hundred fifty dollars ($150.00) per month. However, said sponsorship does NOT grant the sponsor any right to possession or use of the horse sponsored, but the sponsor may visit the horse with adequate notice and arrangements for a visit. GEVA also seeks those who can provide a loving and caring home for some of our residents. Our adoption program offers an excellent opportunity in the horse world to obtain a show or pleasure horse at a fraction of the market price. Our horses may be adopted with our knowledge that they will receive quality care. However, any further replacement must be approved by GEVA.. All such restrictions are intended for the well-being of the horses. Glen Ellen Farms donates to GEVA the profits from the vacation rental. The farm is located in the scenic Valley of the Moon of the Sonoma Valley wine country, which attracts numerous visitors. 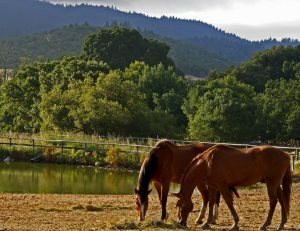 The farm can provide stabling or paddocks for horses if guests wish to bring their equine companions to enjoy the miles of spectacular scenic trails nearby in Annadel or Jack London State Parks. If you have a soft spot in your heart for horses and are concerned about what happens to them when they can no longer perform or are no longer wanted, PLEASE HELP US HELP THEM. If you are interested in a career or vocation working with horses, we have a variety of programs to offer you. If you really care about horses please contact us. If you are interested in sponsoring or adopting a horse we have a list of the horses available for your inquiry. We really need your help in helping them. Don’t they deserve it?! We think so and hope you do too.